Today we will tell you about Vidya and Bobby’s wedding that was full of emotion and also became the happiest moment. Bandung never disappoints us. As well as the people who are friendly and pleasant. Including this great couple. It is such an honor for us to be able to cooperate with Vidya and Bobby in capturing their important moments in this beloved city. 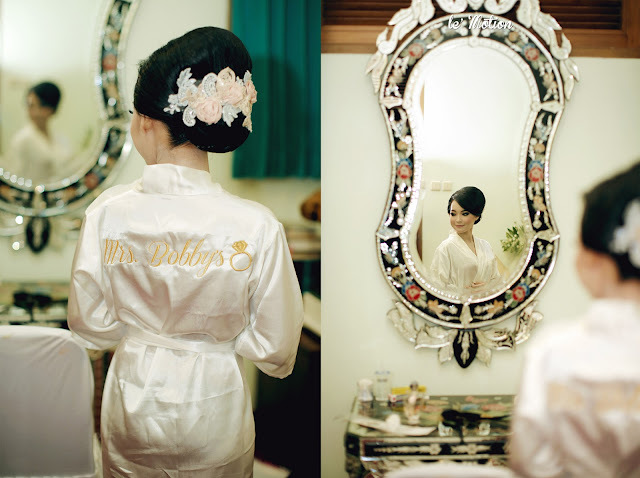 The wedding, which was held in Bandung ran with wisdom in each events. Quran recital and splash of water (siraman) ceremonies were done a few days before the reception ceremony. Quran Recital event namely praying together was held in order to be given grace on the wedding day. And a splash of water ceremony is a traditional Javanese ritual of parents shower their children (the bride), which aims to be holy inner and outer. The next day the couple held a procession ceremony in the morning and immediately followed by several traditional rituals of Java, Balangan Suruh Ritual, Ritual Wiji Dadi, Weight Ritual, Ritual Kacar Kucur, and Ritual Dhahar Kembul. In the evening, the reception event was held and done with a procession of pedang pora that must be done for the groom who works in the police world. Not a few of our clients work in the military and police,so this moment was what we've been waiting for. As pedang pora procession is one of our favorite moments, we endlessly enshrined this moment in every second. The reception event was very lively. Vidya and Bobby’s happiness radiated from their smiles that day. Vidya and Bobby is a partner that we believe will always be showered with happiness and affection in their married life.